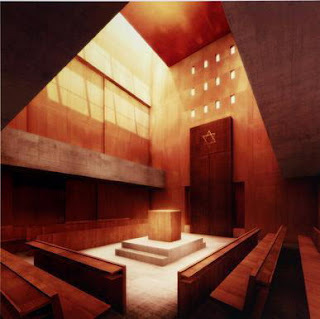 Following up on news in our last newsletter: The design of the new synagogue in Ulm has been approved. City fathers, together with Germany's Jewish community, unanimously chose a simple, stark concept, Bauhaus in nature, although not directly referred to as such. This article contains a couple of pictures, along with (German-language) description of reasons for choosing this particular style. While generally good news, I was reminded of two ongoing struggles for Germany's Jewish community. First, it was a foregone conclusion that this had to be an Orthodox shul. So women may not worship in the level depicted here, which is reserved for men only. Second, some of the feedback from Ulmers about this synagogue reflects disturbing trends. Instead of celebrating rebirth of a lost community, a few idiots are saying things like, Does this now mean we have to tolerate construction of a mosque? Let's hope this is a case of two steps FORWARD and one step back, and that the new synagogue and JCC will bring the city renewed understanding and a big dose of tolerance.